The futures have stopped right at 62% and judging by the wave structure, it looks like we’ll turn here and head down. What is the best indication that this count may be wrong and we will head up to 2020? If your current count is correct, would it mandate a down close today on the first wave lower? The futures over the weekend part is confusing to me. Does the SnP 500 actually need to make it to 1964 (62%) to satisfy your analysis or has the futures action done all the validation needed? I maybe don’t understand the question, but the answer seems obvious to me. If we don’t turn down here, we’re going up. In EW, we generally look for a first motive wave down (in 5 waves) and a retrace of 3 waves to 62%—at smaller degree (say, the 5 min chart). So that’s the safest place to get in. EW is fractal, so the same structure happens at multiple levels. All the indices should open at 62% and head down. They should all satisfy that criterium. The futures are just the leading indicators, as they’re all that’s open. Ok, this is what I was getting at! We are open now for 7 minutes. The SnP 500 is at 1970 which I would think is significantly above the 62% level. Is this throwover enough to assume the move to 2020 is on? thanks.. I ask because anyone wanting to get onboard for a really profitable trade, needs to be in early and in the correct direction. A move to 2020 from here is a huge gain. As well as a short and new move to August lows. You never trade the first 15 minutes. The Nasdaq is not at 62%. This is going to be a huge move. Relax. You don’t need to be in early. That’s why I gave you to optimum entry point. I feel like the top is nearby. I bought some put options for the AEX Index (THE Dutch Stock Exchange). It looks like S&P can go to +-1970 to finish an ABC. From a fundamental perspective, I have a gut feeling something international (China / Russia in Syria is going to trigger wild volatility in equities / oil /metals. This is shorting. You only want to be in early if you like pain. Joined Dave in the short side. Around 197.5, bought spy puts. Drilling way down to the one minute chart, this looks like a final fourth wave to me. Nasdaq isn’t quite at 62%, so we’re waiting for it. Once it’s there, I would expect a turn, as all the other indices are there. SPX is almost at 1.618 X the A wave. In my experience, all the indices have to make 62% (NQ already there, of course), but Nasdaq still a few dollars short. The 62% level for it also puts the C wave 1.618 x the A wave. If it’s the final fourth wave where do you expect the fifth? Hopefully my Nasdaq comment also answered that question. Not very far away. Well do you mean the fourth of the C wave up? Or the fourth of higher level? C. I’m still on a one minute chart … haha. 4779 for Nasdaq is the target (or close). Tick tock it must do it now 🙂 because European markets close soon and Andre said lunar degrees cycle predict a turn then. If we turn here, we’ll be heading to the low 1700s in the SPX at least. Exactly. 1986 is the point at which wave C of SPX is 1.618 X wave A. No, the reversal is certainly not for today. Almost there. ES gap 1976.54 to fill is also near. Yeah, it’s an amazing move. There is a part of me that wonders if we’re going to turn down in a 4th wave and then do a fifth up to the top (SP 2020), as per my preferred count, but the Nasdaq is so much weaker than everything else. In any event, we should turn down as everybody reaches their respective 1.618 x wave A targets. A larger move up would have to be left to the futures overnight, so we’ll see what happens here as we get closer to the end of the day. We would have to come down first and then go up. The alternative is that we head straight down. What if this is going to be a repeat of Oktober 2007? Or do you think that this is not possible looking at the wave structure now and 2007? There is also alternative to continue go up like a steam roller. SP500 has just passed the 1.618 X wave A length, so I think my preferred count is in play. We indeed could go straight up, but then it’s not an ending wave (which should be in 5) and I have no clues to suggest an end point other than the previous high at 2020. We just have to wait to see what happens. WE could go into a fourth wave here. Of the C wave, the two legs in futures are equal. If we do a fourth wave, then likely we have the fifth tonight or tomorrow and test the top. Well, I wouldn’t call it irrational. We’ve had three waves down and that means we have to retrace to the top. That’s the count and what I’m sticking with. The alternate was to turn over at 62%, which didn’t happen … obviously. Even so, it could catch up. Do you think that we are condemned to go up to the top or we may turn down any moment? I’ve had this count since September 26. I’ve explained it over and over. Apologies if I took it the wrong way. It’s a tough market, but based on my experience, we have to test the previous top (and could go higher). I’m also expecting the GDOW to retrace to 38% and it’s almost there. what do you think about the way we go to the top? We’ve taken 90 points without any retrace bigger than 5-7 points. Are we still in the 3rd wave of C ? Should we make any significant 4th? I would expect a 4th wave tonight because I can count 5 waves of C. It should retrace 38% of the entire length, really, which would take it down to SPX 1943. That’s if it’s a 5 wave ending wave. The fourth wave of 3 is at about 1970, so depending on whether the wave is going to top at 2020, or going higher, it could also just drop to that level. I’m inclined to just let it do it’s thing … and stay away. But if you’re nimble, there could a good short trade tonight. But if it is in three there shouldn’t be the fourth wave. That’s if this wave is a second wave and if the first wave down was in five waves. 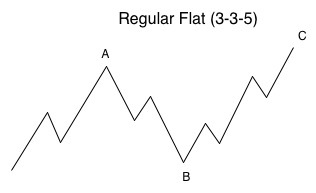 My count says it wasn’t (that it was an ABC wave down) and that we should get 5 waves up to retrace to the top. This is what my count for the past week has been suggesting. The second wave idea would only happen if my count was wrong. So far, it appears to be right. I see EWI is rethinking their count tonight (good for them … haha … but I was there a week ago!). If you look at the first chart I posted last night – of the DOW, where I suggested we were going to do a flat (to kiss the previous high, or trendline), that’s the scenario I’m expecting. To get there means we should turn down in wave 4 tonight and then go up in wave 5 tomorrow (a bit of a guess at this point). I added a chart and explanation to the post, which I hope will help with what is difficult to explain in a comment. if it goes in the fourth wave it should retrace to what level? we only have 3 waves down from the May top. 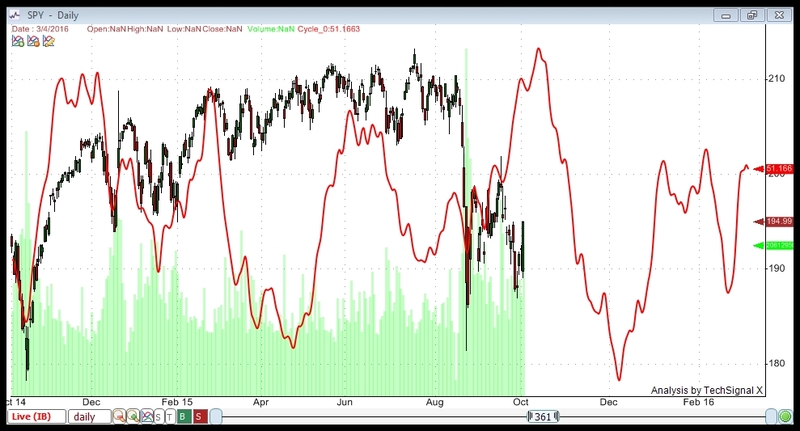 peak should come Friday- Monday yet that is the momentum peak not the end of the puetz window . 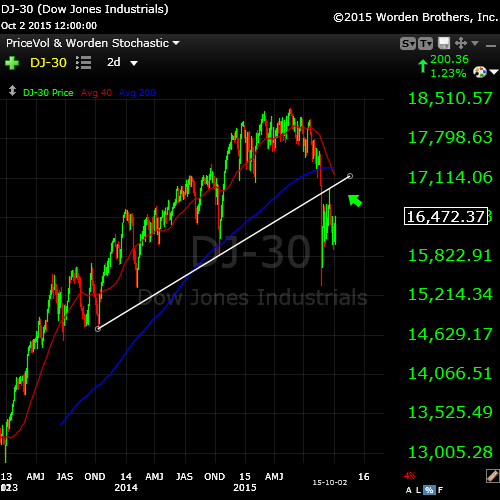 we are now testing the Dow projected price range which should have come Friday . I would assume today was a catch up day . higher prices should follow into Friday- Monday . food for thought , the 1.618 extension is somewhat of a myth . It was a productive day for the bears thanks to the biotech stocks. 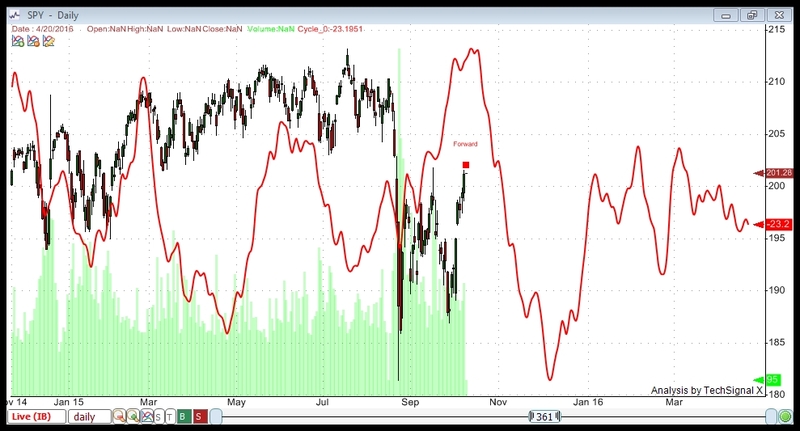 Joe, your inverted crash cycle is interesting but bad news for my spy puts. Still short. I am not buying this BEAR MARKET Rally. Will remain short til tomorrow afternoon. NOTE TO SELF : NO FULL POSITION GOING INTO A WEEKEND. Rookie mistake. $SPX, $SPY closes at 1987 in October. Doesn’t get any scarier than that. What I’m having the biggest issue with (and I’ve mentioned this before) is that this entire mess of a wave from August is now too long to just be wave 4. It could be a second wave. SPX 2020 is exactly the 62% retrace level from the top of what we’re calling wave 3 down. The outcome is the same, of course, because whether we’re going into wave 3, or wave 5, there will be two very large waves down. Frustrating market, for sure. It’s not clear-cut. We haven’t had a complete set of 5 waves down, so there’s no confirmation of the trend. Peter, How would you respond to the following here ? What level for sp do you see if we are indeed finished A and now going to B wave? Rather than write this out here, I’ve put a new chart at the top of the post showing what an ending wave would look like. The entire pattern from Aug 24 could also be a regular flat, which would mean the C wave (which would be in 5 waves, as I have shown) would go past the top of the A wave, which is at 2020 in the SP500. Because the B wave down last week is an ABC wave (or at least I believe it is), these are the patterns that would be expected. what 2nd do you mean when you talk about “larger 2nd wave” in your explanation? The consensus has been that we saw wave 3 down from the top of the market and that we’ve been in wave 4 since August. However, we could just as easily have had wave 1 down and be in wave 2. I think there are more reasons to suspect the second scenario. Wave 4 should take a similar length of time as wave 2, but it’s now taken much longer, particularly if we go to a new high at 2020 SP. Wave 4 has also retraced to 62%, which is a normal retracement level for wave 2. Wave 4 usually retraces only 38%. Wave 4, if it ends up being a regular flat, going to a new high above 2020 SP, would be a pattern that’s usually attributed to wave 2. I’m leaning much more to this being wave 2. Which means we would have wave 3, 4, and 5 down still to go. But let’s see where the wave we’re in goes before getting too much ahead of ourselves. Well, yeah, because wave 3 would be 1.6 times (at least) X wave 1 down and then you have wave 5, which would again be about as long as wave 1,2, and 3 combined. So … keep the powder dry. It’s more important to be ready for the drop than to play these little ups and downs, imho. Plus, you saw how the first wave came down from the top. If it was wave 1, wave 3 should come down much faster. I also follow MC Hugh he is on the same path like you with the wave count if we go beyond SP 2020. If this happens he considers this also as a wave 2 and the third wave will likely take us down till 1500-1600. And with that in mind, I expect to see a good-sized fourth wave today. And then up tomorrow, perhaps to a high. I thought we already did that in the futures..
I’d call that “essence of 4th” and we have none in cash. How deep may go this Fourth wave? Normally, I would say ES 1937 … lol … that should still be the case here. I don’t think this is going to be particularly deep. I think NQ should get to 4250, the fourth of the third, but beyond that, not so sure. I count 5 waves down so I think this 4th is just about done. The shallowness bodes well for us topping in the 2020 area rather than much above it. We’ll see. That’s better! Hopefully, Dave will get some relief today. I have got such a feeling this goes much higher first it will blow it self up.. When ever I make a trade, I always have a plan (B) if I am in correct. If the sp does head up to 2020 on me with being stuck at approx sp futures 1940. I would buy some puts at that level. When ever I make money on any trade, I always put the money in my rainy day fund. (Pay Myself fund) Those funds is where I would use to buy the puts. I doubt the sp will get their thou in the near future.So over all, I have no anxiety whats so ever at this point. I’ve added back to the bottom of the post the Puetz crash window info just as a reminder of where we are in the cycle. Thinks have to move quickley if I look at the timeframe till new moon. We’ve come 97 points in two days. We have 50 more to go to 2020, so I think we’re OK. I would say we are in the panic buying phase since the 30 of September. you mentioned a retracement from last nights high to ~ 1937. Is that still in play? No, I mentioned in a recent post that we’re likely done the 4th. There’s a law of alternation that suggests if you have a deep second wave, you have a shallow fourth, and vice versa. This also bodes well for a top at 2020 rather than too far above it, imho. Sorry, not in a recent post, I mentioned in a recent comment. I don’t remember who asked be about GDOW (was it you?). It’s almost at the 38% retrace level and should turn down there. If we’ve finished the forth, how come we are going lower? The DOw was up 50 a few minutes ago and now its only up 12.
the SnP is down 9 !! Cash came down in 3 (not a motive wave). I’ll agree with your read on the wave up. If you have any concerns about that look at SPY, DOW, and NYSE. These retracement levels are really interesting! 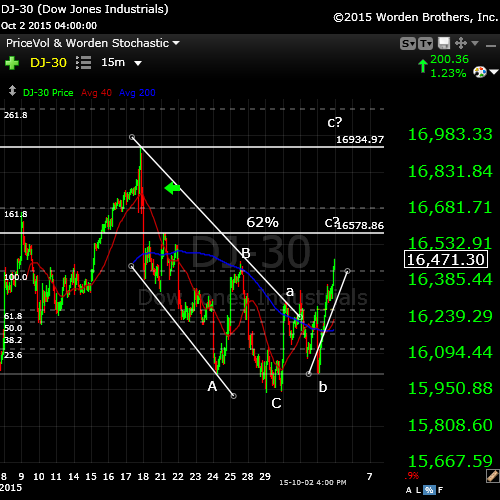 The Dow has made a 100% retracement (16,934). The Snp has gone to the 1.618 level on the chart at the top (1997). Nasdaq has made a 62% retracement (4779). all pretty much at the same time. I added an update a few minutes ago to the top of the post. So far as expected. It remains to be seen if we’re going to the 62% retracement from the very top of the market. I added a short update at the top of the post. Added a chart to the update. What is your idee or time frame when we reach this target (2030) can we go back and forward for a while or does it turn quickly? No idea on time. Today or tomorrow. We seem to be running out of steam, so more likely it could be tomorrow morning. It will just run out of gas at one of those targets likely … at about the time the bulls’ egos are at their largest. What we’re ultimately looking for is 5 waves down at small degree and 3 waves back up to 62%. If we turn there, we’re done. I am watching this latest wave down as a good candidate, but I’m expecting to see the full five waves up to a final top. We are running out of steam fast. This 2011 vs 2015 cycle correlation is stunning! It would suggest a reversal today or tomorrow. As I mentioned the other day, I fully expect some international incident to kick off a reversal. Actually the downturn may happen just ahead of an incident. Peter, correct me if I am wrong. When this wave down you are looking for starts, it will be swift and unmistakeable. Correct? Events don’t move the market to any great degree. It’s the other way around. Pundits are still scratching their heads about the labour report … haha. We will just run out of buyers likely. You want to watch for five waves down at small degree close to the targets I mentioned. This looks like the second wave of the fifth, so we have 3, 4, 5 to go. 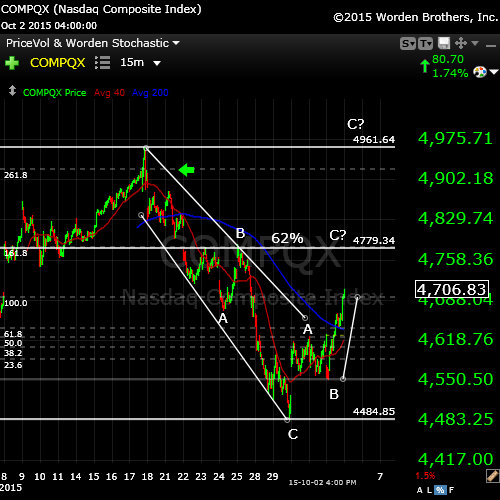 Nasdaq looks like a small 4th wave so far. 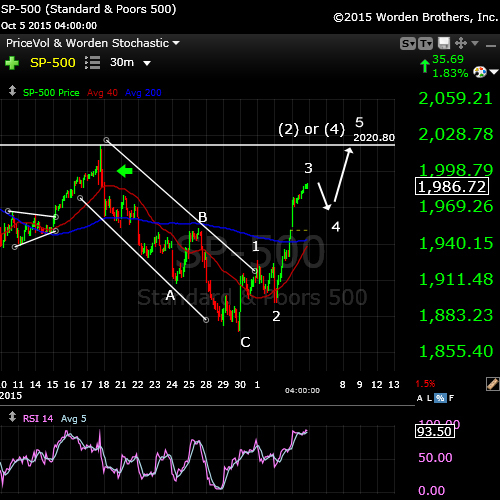 We look to have completed wave 1 of 5 in the SP500. Measuring this first wave and extending 1.618 from the bottom of the second wave puts us at about SP 2030 as a target for a top. Sold half my shorts down at the 1969 level. I will keep the other half for now. My worst trade of the year. Wiped out my gains from last week. Good luck every one. You will more than make up for it shortly. Sold the other half and went long here at the 1971 futures level. This was when the sell off occured. LOL I know Peter, it was already in the waves. Well, not in the wave, of course, but international mood has turned decidedly negative. We may be setting up here to head down to 1960 ES to complete the fourth wave. I count the wave up in 3 waves. Looking at the bradley the move from Sept 29 till now (inversion in the graphic) was spot on it turns flat and turns tomorrow /friday . So that’s what we are looking at. Backing out the charts to 30 mins, I can put the Nasdaq in a large triangle, as well as the SP500 and NYSE, but not the DOW. I don’t have much of an idea why we’re stopped. The 62% retrace line is at 1990 SPX. The wave down could be in 5 … market is not helping with any clues. Sold half position at 1984 futures. I will keep one half for now. Bought back my other half at the 1979 Futures that I sold out at 1984 level. Full position long. I’ve added slightly to the post. It’s getting late in the day, so I suspect we’ll continue this triangle into tomorrow. This may just be a running triangle, which could then end in a fifth wave up to the previous high. Sold one half at 1984 Only a 5 point gain. I’ve posted a chart of the possible ending diagonal on ES. There is nothing about this market that I find enticing. If this is a triangle, we should have one more leg down and then a leg up to a high. We only have ABC at the moment. New chart on the post of the SP500 with a triangle forming. I’d say wave 3.5 just ended with some kind of ending pattern in 5 small waves. I guess we are going to my 2040+- as I have been saying all the time (yes I know, it didn’t happen at that time, only 2011 was reached) with the overshoot possibility to 2070+-. My guess would be tomorrow hard down to make wave 4 38,2% at 1950 (of course 23,6% is also possible, targets will go up if this happens), than wave 5 (161,8% * wave 1, else 100% = 2018 or 127,2% = 2035) 2060. The market is really really really weird. We might still be in a VERY COMPLEX wave 4 (in EW terms, WAY TO LONG IDEALLY, but can be because we just ended a multiple year bullmarket and people still think the only way is up!!!) of the big wave 1, so 5 will come after until the end of October (28?) I would say. AEX target looking at harmonics = 446-458+- so my guess would be 460 (gapclose). So we go hard down first (to 435?) tomorrow morning so that we go even harder up later the same day and Friday. That is it for now people. Just to be clear, I talk about the S&P 500 future chart (ES). I’ll stick with my forecast, thanks … haha. Your Oct 28th thru the 29th, is very interesting. I have as the most BEARISH day of the month. I also have Oct 16th as the 2 nd bearish day of the month. I will bring these dates up as we approach them. 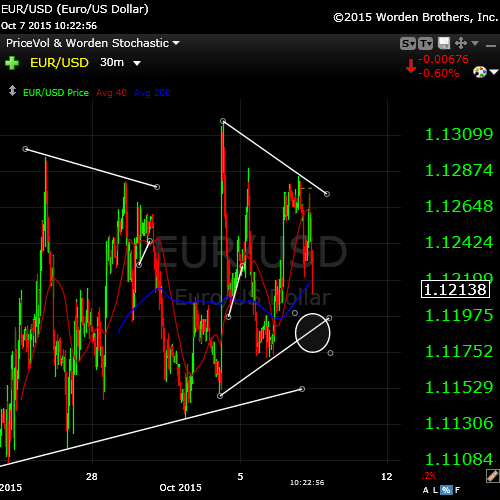 From today on till monday the 19e I am bearish. the high was on 19 of Mai at 2137 and the low was on 24 of August at 1834. So, 0.618 retracement gives me 2021 – precisely what we’ve done on the 17 of Sept.
What other 62% retracement are you talking about? If you look 5 min chart it was in the first 5 minutes after the NY open. Oct 16/19 is also important for me yes! I would say we go for a low, but it is hard this market… Than some retrace back up and hard down again till 28/29 Oct.
What is your estimate for the AEX? I wanna see 39x at least to complete wave 5 down (if my complex wave 4 i(we are in C now) is correct of course). I don’t know let’s wait and see.. Went long this morning SP 1982 futures full position. I suspect short term trade. If we do not head up here shortly, I will bail on this trade. SP futures at 1983 at the moment. Short update at the top of the post. Targets for SP500 and SPY. I would love to short this market. But you never short a quiet market. If my indicators change, I may short it a little later in the day. Good Luck every one. If we get a retrace of today’s highs, I may short it. It is very dangerous to short a quiet market. But with the fed giving their up dates at 11;00 I may go for it. Fed meeting at 2:00 NOT 11:00 11:00 west coast time. My system tells me we will top tomorrow. One more last push up and than time for a BIG WAVE 5 down till the end of October. This was some kind of flat wave 4 if you ask me. Looking at the action today, I agree with Peet on the 2020. You don’t think we will see a final push to SnP 2020? Take one more close look at the chart attached at link. Gary, I am not looking for any crash right here. Just a retrace move down from here at the 1992 level. I would happy to see it move down to the 1970ish level if that should occur. Because the fourth wave triangle was a bit “muddy,” it’s difficult to project an end to the third wave of the fifth (the one we’re currently in). ES is a bit clearer so I’ll take a stab at 2006ES and the counterpart of 2014SPX. It looks probable to me that we’ll finish up overnight or early in the morning tomorrow. 2nd half, short for full position. Bought 1992 Average price for the two at 1990 futures. That is a shame Dave. This may well be the last push up here before Peter’s target. I still think we will fall short of 2020. Although we are at 2017! Peter may show a count that finds that acceptable. No, I’m projecting 2031 now, based on the length of the third. The fifth of fifth is usually the same length. This should be the end of the third in ES, I would suggest a drop now to about 1986. That 2031 is in the SP500. Normally, they should fight at DJ to protect 17.000 at the close. I shorted ES at 2008. This fourth wave should retrace 38% of the entire move up from the previous fourth, which is actually about 1990. Then we’re back up to 2031 to finish off. Those are optimal numbers. We’ll see what happens. We’ll come down in 4. The final wave up will be in 5. Sorry … down in 3 … haha. Here is an interview with Stan harley explaining his cycle work. I won’t get a chance until the weekend. It will stay there so pick your time but I m sure you will find it interesting to listen to the method and calculations he makes. I think tomorrow the Top has to be in looking at the bradley. Funny I did not know the date! I wrote on this blog Okt 19…. He is a good ranked high on timer digest many times so I advice you to listen yhe hole interview. The news coming from bad to worse, profit warnings, earnings reduced, emerging and commodities at the floor. are you still playing this fourth wave? What is your invalidation level if we continue to extend higher instead of retracing? Hmmm. I just walked in. This could be just the tail end of wave 3. In ES, I’m likely out at a new high. But it should correct. RSI is suggesting we’re going to roll over. And we have hit the SPX 2020 objective! Please look at this strange anomaly. I can go back for days and not see the erratic lines you see at the right of the image. I have no idea what it means. It is from a Stochastic. Let’s see the first wave down. They don’t like to go down directly. The safe place to enter is after 5 waves down and three up (62% retrace). They should first break down 2000SPX and 17.000DJ. Yeah, the retrace last night was tiny, so I suspect we’re going to finish up at 2020. Peter, when you say “finish” do you mean we may start the wave down from here? Or 2031 may be next? Thanks Peter, from an EW standpoint, the initial reversal should get pretty impulsive to the downside based on the completion of this 5th wave correct? Otherwise another set of waves up to complete 5 to 2031 could be in order? Yes. I honestly think this is it. We would have had to have a really good correction last night to shoot up much further I think. Impulsive down is what we’re looking for. A double top at 2020 would also do it for me, with the same on ES, NQ, etc. how do you see the wave Five you’ve been waiting for? Yes, could be the wave up this morning and we’re simply doing a double top. It’s rather shallow, isn’t it? This looks better here on SPX … the first wave up to today may have been 1,2,3, with a large fourth and now a fifth with another fourth that’s struggling. Hard to tell cause I’m looking at tiny waves at this point. I don’t see any waves in 5 down yet. I’d look for a double top here, but would want to see ES finish up at the same time. Looks like a 5th of 5th of 5th in SPX. This seems like really erratic inconclusive action!! It’s just trying to make a double top. You can’t start an impulsive wave down in 3 waves, so it has to be a fresh start. And everyone’s trying to go it at the same time. As long as we don’t go to a new low, it’ll get there. Dropping below 2008 SPX (the previous 4th wave) is a good indication it’s all over. The Nasdaq and DOW look like they need the 5th of 5th of 5th still to go … one more tiny wave up. Peter, when looking at it as you are it is a process unfolding. Pretty amazing! Yup. yeah, it’s always amazing. You don’t think they’ll get there, but they always do … and then all hell breaks loose to the downside. All the waves of 5 up need to complete. I think the big guys will take today some money off the table but will not push the market. No more will happen today, I don’t think, other than to maybe begin the final wave up. This appears to be a larger fourth wave we’re finishing now, so we should be one more set of 5 waves up. It looks to me like it will take everything up to the 62% level, which means when we turn, we’re going into the larger wave 3. 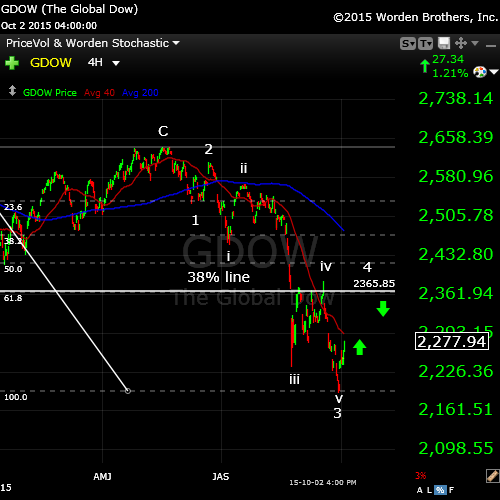 The entire correction from Aug 24 would be wave 2 – why it’s taken so long to conclude. I really appreciate you analysis Peter! Since your SPX 2020 call appears to be valid at this point, do you have a preferred target for the 1st wave lower? Thanks for the kind words. I actually talked to Bob last week or the week before and told him the market was going up … haha … he didn’t expect that. They were focused on going down (it was the abc down that I called that EWI thought was a motive wave). I think the issue is his people. I find them quite biased and bit sloppy, unfortunately. And you can’t be sloppy with EW … it will bite you hard! lol. I will post on the weekend. I can’t really give a length for the first wave, as the first wave is always the unknown. After you get a first wave down, you can define all the others (their possible distances and ratios, at least). But I can extrapolate to some extend off the first set of waves down. There’s also a question as to whether this correction is a fourth wave or a second wave. I think it may be a second, but then NYSE has only retraced 50% from the top. So there are some issues here, for sure. Hmmm. 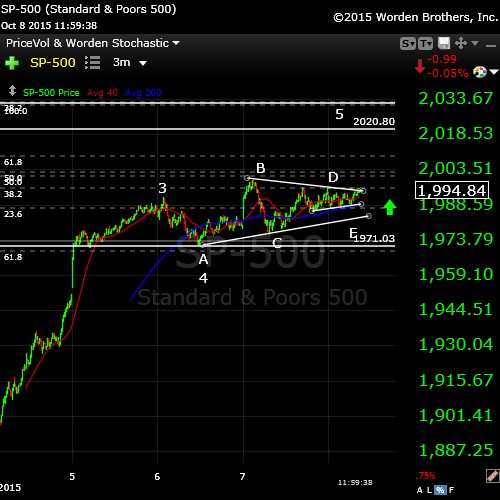 SPX is setting up for a wave up. We may not be out of the woods yet. So is ES. Be careful. If we stop at 2020 on the way up, great. If we keep going, we may yet see that 62% level at 2031 or so SPX. Also the Nasdaq is sitting in a weird spot and may need to get up to 4961 or so. 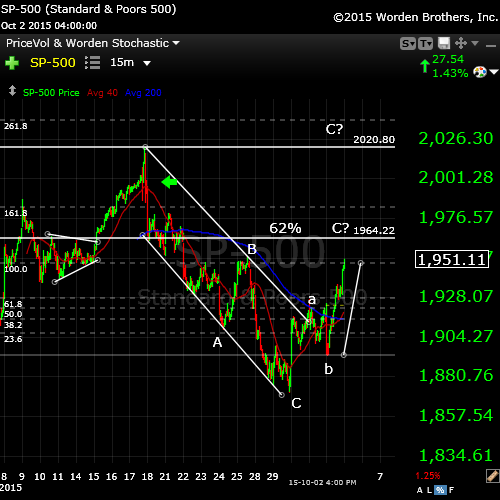 SP500 has come down to form a double pronged second wave, which could lead to the third wave up. Yup, I’d say we have one more set of waves up, which will take us right through the weekend and maybe Monday. The bulls have control just a little bit longer. I’d be surprised if we stop at 2020. The drop in the SP500 spooked me but I think we’re still pointing up. Will just take a while to turn around. We haven’t broken down technically. Just to append my previous comment. Based on us having to do another leg up, I may do a brief post on the weekend. You asked the question re: an order of magnitude for the drop. Based on all the indices finishing another wave and going up to the 62% retrace level from the top (which would make this the second wave), the drop of wave 3 through wave 5 would take us below $11K in the DOW.